Trump reportedly pushed Comey to publicly clear him in FBI Russia probe. It’s still early days in the Trump v. Comey heavyweight fight to define the reality of what exactly was said between the two men behind closed doors. The stakes are, of course, high as their encounters—or how they are perceived and whose version is believed—will go a long way in determining whether Trump obstructed justice, legally speaking and in public opinion. Since his firing last week, Comey’s corner has been publicly setting the stage for the former FBI director by leaking bits and pieces, drips and drabs, along with bombshells, of Comey’s side of things. And it has been devastating for Trump. The release of portions of Comey’s memos to the New York Times, which chronicle his interactions with Trump, has shaken portions of the president’s Republican support in Congress and effectively prompted the appointment of special counsel Robert Mueller. After the Comey memo, which detailed Trump’s attempts at securing the FBI director’s loyalty and commitment to lay off in the investigation into then-National Security Adviser Mike Flynn, the feeling was that Trump’s actions were minimally unbecoming of a president, but the public discussion quickly turned to what, exactly, is the definition of obstruction of justice. And what does it look like in the real world? That’s a worrying development for Trump. On Thursday, the New York Times added fresh logs onto the Is It Obstruction of Justice Yet? fire. President Trump called the F.B.I. director, James B. Comey, weeks after he took office and asked him when federal authorities were going to put out word that Mr. Trump was not personally under investigation, according to two people briefed on the call. Mr. Comey told the president that if he wanted to know details about the bureau’s investigations, he should not contact him directly but instead follow the proper procedures and have the White House counsel send any inquires to the Justice Department, according to those people. Those interactions included a dinner in which associates of Mr. Comey say Mr. Trump asked him to pledge his loyalty and a meeting in the Oval Office at which Mr. Trump told him he hoped Mr. Comey would shut down an investigation into Mr. Trump’s former national security adviser, Michael T. Flynn. Mr. Trump has denied making the request. 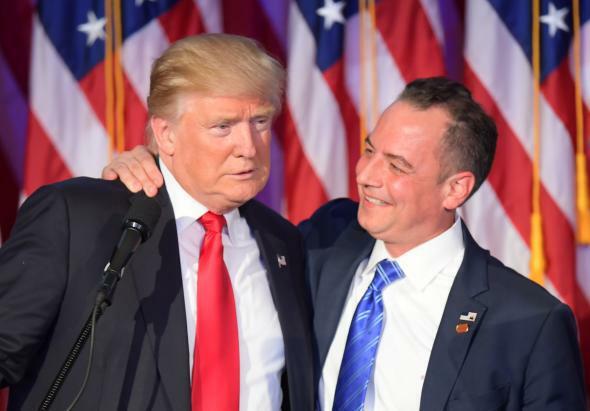 The day after the Flynn conversation [between Trump and Comey], Reince Priebus, the White House chief of staff, asked Mr. Comey to help push back on reports in the news media that Mr. Trump’s associates had been in contact with Russian intelligence officials during the campaign. The Times story adds incremental credence to the assertion that Trump was poking around for ways to curry favor with Comey to quietly relieve some of the pressure the Russia inquiry was putting on his administration. The Trump White House has obviously denied more or less everything, but has so thoroughly leeched the credibility out of the office of the president and the man who inhabits it that it’s difficult to know if the administration still has its ethical bearings enough to even know where the truth begins and ends anymore. Given everything we know about and have seen of Donald Trump over the past nearly two years as a candidate and now as a president, it seems not only highly plausible, but a near certainty, that Trump would do anything he pleased to discredit or, better yet, end the investigation into him and his allies. If Comey’s version is to be believed, it’s clear what Trump was getting at during his discussion with the man who was in charge of investigating him. Was it unethical? Yes. Was it improper? Yes. Was it obstruction of justice? A few more drips and drabs and time will tell.